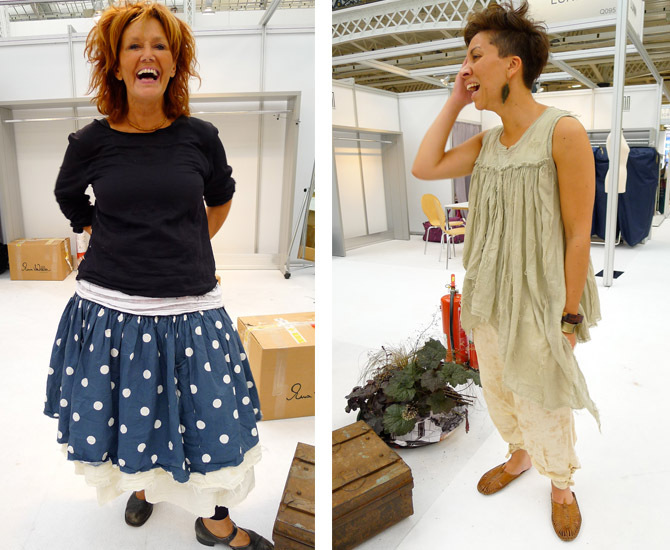 While at the fashion trade show Pure London for our panel discussion this week, we couldn’t resist taking a few style shots of some of the independent buyers and brand designers/sellers busy negotiating Spring Summer 2013. It was a mini master class in what to wear to be comfortable in hot weather, as it was a blistering day and most of these ladies were on their feet all day either buying or selling (note the flats….) so needed to stay cool and stylish. At Christy’s Hats we saw a super-useful looking oversized T shirt dress in printed silk (above left) which was ‘Richard Nichol for Fred Perry- from the sale site!’ according to the wearer…who claimed she had hardly taken it off since buying it due to its comfort and general gorgeousness and sure enough, here it is, don’t all rush at once. 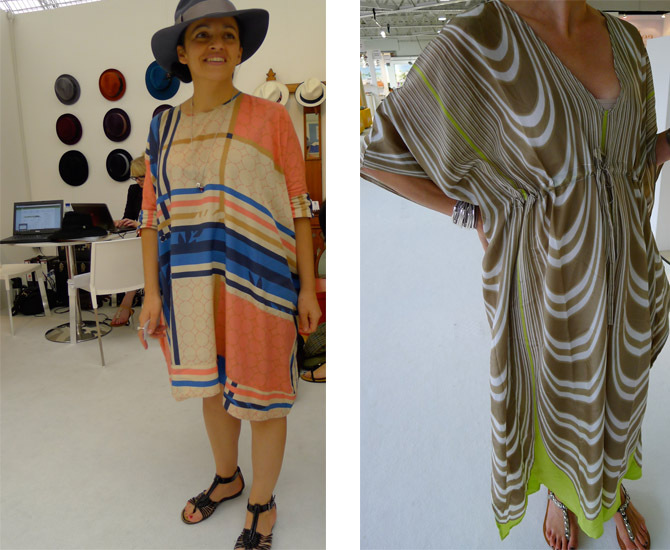 The Echo kaftan looked cool and easy to wear in the heat and surprisingly smart as daywear. I just adored this lady in her tailored chic-cream combo, her safari jacket is ‘old Wallis’ and her macrame belt comes from a charity store but her whole look has a carefully crafted elegance. She’s also ahead of the trend as autumn marks the moment the trouser suit becomes big news again, and of course it helps that she is enviably slim. 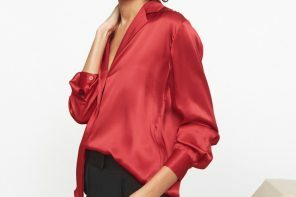 A romantic version of the white cotton blouse above, it’s by HIGH and is nicely detailed with dainty tie neck detail and cut away embroidered sleeve edges. Looks good with the soft gathered-seam pants too, also (I think) by HIGH, which now has the ex Marithe et Girbaud designer Claire Campbell woking for it, hence the edgy gathering and layers. The Independent Jules B sells the range if you are interested. Love the shoes, love the jersey-cuffed cropped length trousers, love the printed scarf livening up a plain black T shirt. Must practise this look. These chic ladies above practising the cool oversized shirt worn with easy white trousers came from the Loose Ends store in Lymington, check the excellent website for more styling ideas if you like this look. Note also the great use of dramatic silver jewellery on wrist and neck and coordinating metallic sandals, silver always looks fab chunked-up over summer linen.